"When the game is over, the King and the Pawn go back into the same box." The book, 1984 by James Orwell, is essentially about the dangers of a totalitarian government, and a glimpse into such a life is like where there is hardly such thing as free will when the government watches your every move. The story starts with Winston Smith, who works for the Ministry of Truth, yet hates Big Brother, the epicenter of the propaganda to trust the Party, the totalitarian government in the society he lives in. The Ministry of Truth, or minitrue in newspeak, the language which is trying to be implemented by the Party, in itself, is a contradiction; while it is supposed to stand for truth, its sole purpose is to forge a history most conducive to the Party. This is accomplished by altering documents to match what the Party says. In the first part of the book, Winston is curious about the past; he doesn’t remember much that wasn’t in the history books, which he guesses, from experience in such matters, were altered. After failing to receive any viable information from one of the older men, he finds an antique shop in the older district with items from the past. From there, he purchases a small piece of coral. Later on, he meets a girl named Julia, whom he despises her because he believes she will betray him at the first chance she gets. However, this is disproven when one day they pass each other in the hall and she drops a simple yet significant note directed to Winston, which reads: I love you. This begins their traitorous and passionate love affair, and Julia becomes a person which Winston can trust due to their mutual disdain for the Party. One of the tribulations the two are confronted by is locating a meeting place where they can be alone. 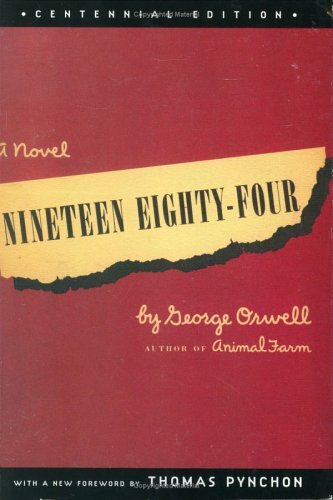 This book represents chiefly represents the horrors that come with a totalitarian government, and I think Orwell wanted to interpret that with a feeling of helplessness to stop it once it’s happened. The book has it’s goods and bads, however what sets this story apart is its realism. My least favorite part in the book is where Winston finally submits to the will of Big Brother because it truly shows the hopelessness of a rebellion in such a place. If I were to change the ending, I would have had Winston somehow find a way to take down the government, because I prefer stories of revolution, and it seems the current ending was dreadfully bleak My favorite scene is in the beginning where Winston first displays his inner desire for rebellion by writing in the diary, “DOWN WITH BIG BROTHER” four times. I would recommend this book to those who enjoy stories about dystopian futures, such as V for Vendetta, which is similar to this story. This is a good review, but 1984 was written by George Orwell.